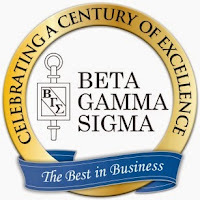 The University of Illinois Springfield Beta Gamma Sigma Honor Society chapter inducted 53 College of Business and Management students during a ceremony on May 2, 2015 in Brookens Auditorium. Tom Gihl, vice president and COO of Illinois National Bank, was inducted as an honorary member. Faculty members David Larson, associate professor of Management Information Systems, and Shipra Gupta, assistant professor of Business Administration were also inducted.